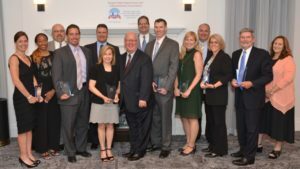 On Friday, June 1, Troy High School Principal Joseph Mariano was named Region 5 Administrator of the Year by the Empire State School Administrators’ Association. Having graduated from Troy High School, he has now been an administrator in Troy CSD for more than 11 years. Mr. Mariano previously taught at South Colonie High School. He attended Siena College as well at the College of Saint Rose and Massachusetts College of Liberal Arts. Since becoming Principal, the overall graduation rate has improved by more than 13 percent. 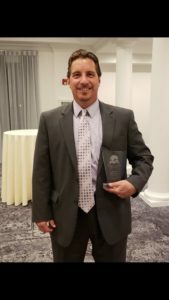 Mr. Mariano has put an academic focus on Troy High School by developing the first in-school Pathways in Technology Early College High School in New York State and he has developed a distance learning initiative. Troy has also increased the number of Advanced Placement offerings, college bearing courses and partnerships with local colleges. He has also guided Troy towards joining the prestigious Suburban Scholastic Council.